Forget about Saturday Night Fever – it’s Bank Holiday Monday that gets funky fans feverish in the South-east at least! This Monday (May 1) sees three (if not more) major all-dayers within the general London area. In fact, since the proven success of the National Soul Festival in Purley just over a month ago, there have been so many promoters jumping on the all-dayer bandwagon that the bottom is likely to fall out of the market before too long . . . not before Chris Hill retires rich, though! This Monday’s Purley Tiffanys do again star Chris Hill, Radio London’s Robble Vincent, Camberley Frenchies’ Chris Brown, Bognor Regis Dantes’ Sean French, Froggy’s (massive) roadshow and – live on stage – Hi-Tension. Easy to find on the Brighton Road a few miles south of Croydon, Tiffanys runs from 2 till 10:30pm. Overlapping rather usefully, from 4pm to 2am, Camberley Frenchies has Robin Nash introducing Radio London’s Dave Simmons, Farnborough Gallaghers’ Johnnie Walker, Sutton Scamps’ Marc Damon, doubling-up Chris Brown, and PA visit from the Olympic Runners. Frenchies is an un-signposted part of the Cambridge Hotel, the first thing you see coming into Camberley from London on the A30. Be warned, there is little point in turning up for either of the above if you don’t already have a ticket. London Crackers, on the corner of Wardour and Oxford Streets, has a less well-published all-dayer from midday till midnight, with funky resident George Power, Chelmsford Dee Jays’ Bob Jones, and some more about whom (apologies) I’m not sure. Meanwhile, the National Soul Festival promoters have also established a roving funk venue called Romans which features a rota of the Chrises Hill and Brown, Sean French and Owen Washington. Opening this Thursday (27) at Guildford’s Wooden Bridge, Romans’ other weekly gigs are Maidenhead’s Bell on Fridays, and Cockham’s Ferry on Sundays. At a recent Harlow Tiffanys all-dayer, the ubiquitous Chris Hill instituted a fake “Olympics”, which could well be repeated at Purley. Teams in emblazoned tracksuits from such clubs as Dimloes and Candles literally competed in dry-land swimming, fake darts, high diving into the crowd and a three-legged moon race! Boobing became the obvious female equivalent of mooning, while funktry dancing (strike The Funky Willow, y’know?) and a new line dance called the Dimloes Shuffle went over big at Harlow. Not to mention the appalling “worst” John Travolta competition! All of which is a lot more fun than boring dancing, Saturday Night Fever-style. Some people do miss the point, don’t they? Tony “Shades” Valence is now joined by Roger St Pierre every Thursday for the first hour of his BBC Radio Medway soul show (8pm-midnight on 290m, MW/96.7 VHF), when they spin fifties/sixties classics in the ‘R&B Revival Hour’. Look out Radio Orwell, as the same format starts there next Saturday, too! . . . The new charity-aiding Omega Disco hopes to play for 52 hours non-stop over this weekend (28-30), to help the Silver Jubilee Appeal, at the NCB Halls in Sauchie, near Alloa, Scotland . . . Still ¡n Scotland, the Strathclyde DJ Assn has recently had a shake-up, with their new committee now comprising Mike McLean, Bob Bennett, John Gordon, Toni Capelko, Gary Muldoon, and Dougall DJ handling record company liaison. Though not due for showing till August, the Casablanca/Motown disco movie’s music is out now as a double LP with an extra bonus single-sided 12in of Donna Summer doing an extraordinarily limp version of ‘Je T’Aime’. She has some other cynical schlurpers too, while there’s typical material from such as Santa Esmeralda, Love and Kisses, and Paul Jabara. 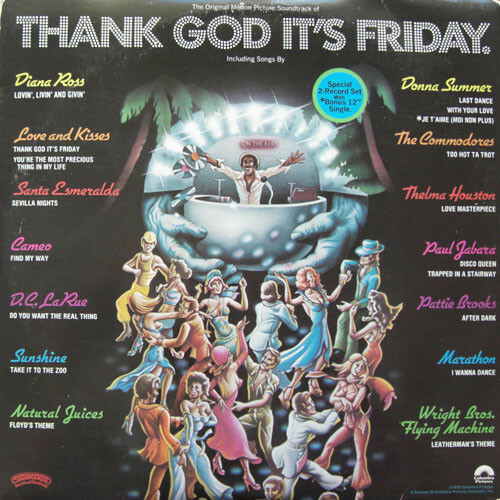 The Commodores’ ‘Too Hot Ta Trot’ joins Cameo’s ‘Find My Way’ as the only known oldies, but star appeal is added by Diana Ross on an out-of-character fast zinger and Thelma Houston on a melodic fast flier. However, besides some not bad instrumental fillers, the best tracks are possibly Pattie Brooks’s ‘After Dark’, a strong steady rhythm tapper, and a madly happy fast instrumental Latin lilter by Marathon, ‘I Wanna Dance’. Many tracks segue almost continuously, while my US demo copy even gives the beats-per-minute (BPM) for each! All in all, fine for pop fans. Yet more Bee Gees mania from that other movie, hitting already – and, actually, Tavares’ best in ages. Greg Lynn moves soon from RCA to helm the disco dept at CBS, where Prelude is the latest US disco label to get a UK deal . . . Thames Valley DJ Assn invite all area jocks to meet Arista’s Tony Berry and watch an electrical shock revival demonstration at Radio 210’s studios this Sunday (23) at noon – the studios are in The Filberts, Bath Road (A4), Calcot, between M4 Junction 12 and Reading . . . ANCO of Chelmsford are demonstrating their new Banc amplification equipment from Saturday for a week at 50 Rainsford Road (phone 0245 58605). Sizzling mixture of old-style ska brass and modern disco rhythm becomes an ever-changing 4:10 trip through different musical noises – hear it all before you decide either way. Hot already with hip London Jocks, it’s on very limited 12 in for extra bass response, and is out here at my instigation so make it a hit, please! Good solidly reggae flip too (they’re minus Toots on these). Typical funky clapper, big on LP last year but now on 12 in with added DJ-type intro. Andrew Bunker now runs Satril Records’ disco dept and is updating their DJ mailing list: send him details at 11 Little Newport Street, London, WC2 . . . Marc Damon of Sutton Scamps is organising an official appeal for £10,000 to provide radio facilities at the country’s largest Children’s Hospital and needs DJ support with charity gigs, collections, etc: contact Radio Lollipop Appeal, Queen Mary’s Hospital for Children, Carshalton, Surrey . . . Les Aron and Trembling Trevor’s new Fifties Again disco (Pagham 4585) spins vintage rock, bob ‘n pop and supplies authentic Teds at all bookings along the South Coast! . . . Roger Squire’s deluxe £2,500 Club 2000 console is now on permanent display in London at the 178 Junction Road showroom in Tufnell Park, N19. All 5,000 12inchers have long been gone, but now the smash funky monster’s been cut down to 3:02 for unlimited 7in! Hot ‘n happy hit import hustler, very pretty in the Odyssey-Charo style, edited for UK 7in only. Oh, it seems Ripple is out here on 12in after all, but they’ll be sold out by now. Radio Luxembourg’s first Celebrity DJ’s in the new Sunday morning 1-2 am spot have been Chessington’s Ambrose Harcourt, Gloucester’s Mike Longely, Canada’s Nick Carson and Teeside’s Peter Quest, while this week’s are Lux’s own David Sarsfield and Cambridge’s Steve Collins, ex-Voice Of Peace . . . Les Spaine has quit jocking at Liverpool Timepiece to become London-based assistant promotion manager at Motown, covering both disco and radio: call him on 01-486 7144 to try for his mailing list . . . John Waller has replaced Yvonne Marvill in the disco dept at Phonogram, where the current DJ list will stand though actual files are being updated. John’s been a DJ here and in Denmark since 1970, but most recently was in Marketing at Phonogram. By now typical frothy disco pop, from you know which movie. Monstrous as an import 12in, the catchy driving zinger’s been edited for 7in only here. What a pity.